Practicing horticulture in the winter may seem like an obscure idea. As a native New Yorker, it sure did for me. Yes, we could prune and do greenhouse work, but that was pretty much where we hit our limit. In the North, we put our gardens to bed and mostly used the winter to prep for the upcoming season with any indoor work we could find. Welcome to South Carolina! It’s quite a bit warmer here, and as I found out when I first started working here a few years ago, there is no putting your garden to bed. They say New York is the city that never sleeps, but clearly they haven’t met our gardens. 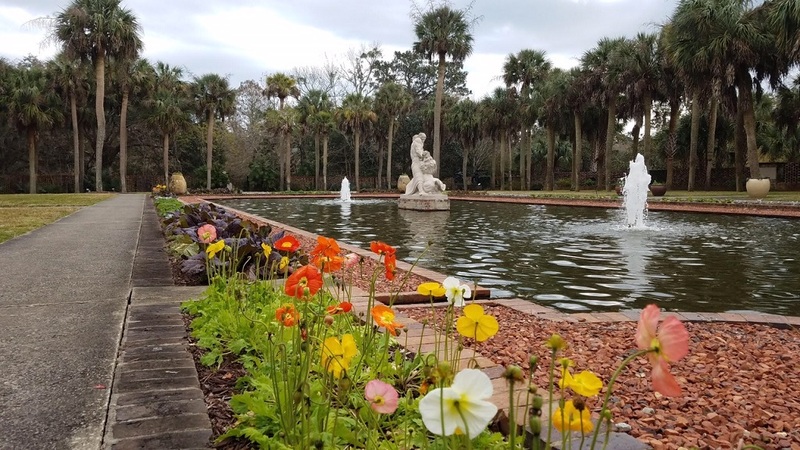 We are busy with the same things our colder neighbors are busy with, but we are also managing cool season plantings, weeds, and working on new projects. Some projects are better kept for the colder months. Although we are still busy, tasks are not as demanding as during the warmer months, allowing us time to do some “back list” projects. We start chipping away at our wish lists that we cannot get to during peak season. Some projects are also better saved for cooler temperatures so we reduce the risk of contact with things like ticks and snakes. Generally the cold makes them less active and less likely to be present. So, what have we gotten ourselves into this week? The pool at Seaweed Fountain in the Upper Right Wing was in need of a little TLC. 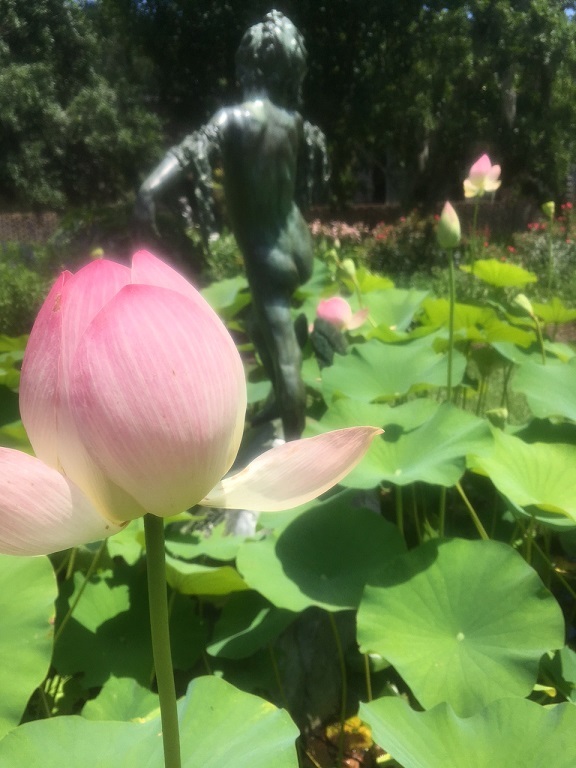 You may have seen our sacred lotus (Nelumbo nucifera) in flower this past year. It has beautiful, large pink flowers, but it also grows so large that it obstructs the sculpture. We were left with a conundrum. Frank, the Horticulturist maintaining the Upper Right and Upper Left Wings, had an idea. It was simple, move the lotus to a pool where the sculpture would not be blocked and the lotus could reach its full potential. We would have a stunning display! As it happened, Frank had just the place: Man Carving His Own Destiny in the Upper Left Wing. First things first, how would he get the lotus out? In the summer, Frank, a volunteer, and I all attempted to pull out a pot that had been submerged in the pool. 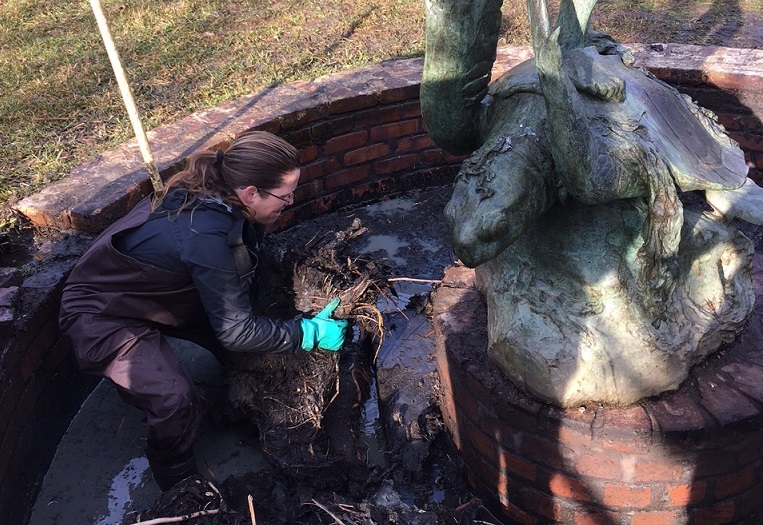 The mud in the pool was so saturated and heavy, the three of us labored to remove it. Digging was not going to be easy, but we needed some option that would work. Out came the water pump to hopefully drain the pool, and maybe some water from the soil. While the pump helped to drain the water, we still had very heavy soil remaining. More needed to be done. With great care, we extracted the soil and the tubers, or root system, of the lotus. 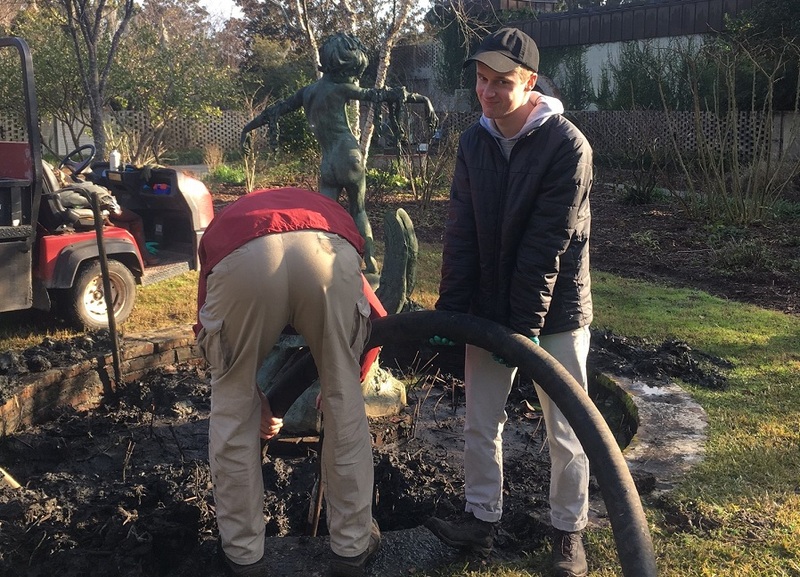 A pile of mud would be removed and dropped onto the bed of the Toro. Between staff and volunteers, we sorted through the muck to find the viable plant material, saving it to the side. The tubers looked like a pale, long, slender potato. As we sorted through the muck, we would proudly exclaim “Potato!” at each one we found. The length of these tubers varied, but as you can see below, they could get quite long. Some of the tubers we potted into buckets, placed between a fine mulch and topped with more of the heavy, wet soil from which they came. Others were preserved in water in a separate container. The ones in buckets would be planted in the Upper Left Wing pool, while the others would be brought back to the greenhouse in hopes of being propagated. Once our cart was devoid of plant material, and filled with nothing more than mud, we would empty it. The cycle repeated for the rest of the day. 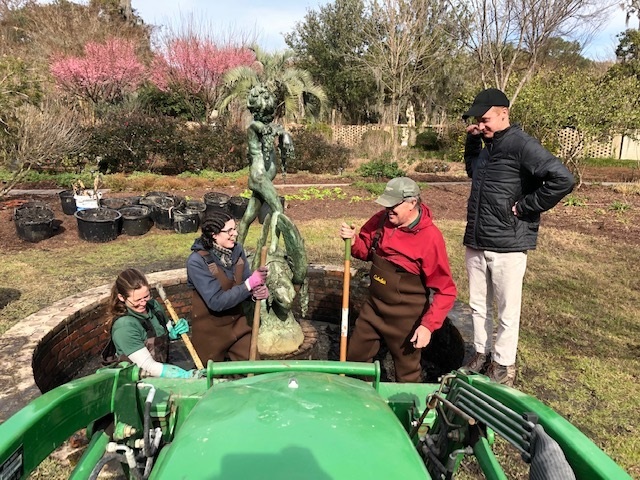 On the start of our second day, we started extracting soil that had plant material already within, putting it directly onto the cart to be brought to the next pool. 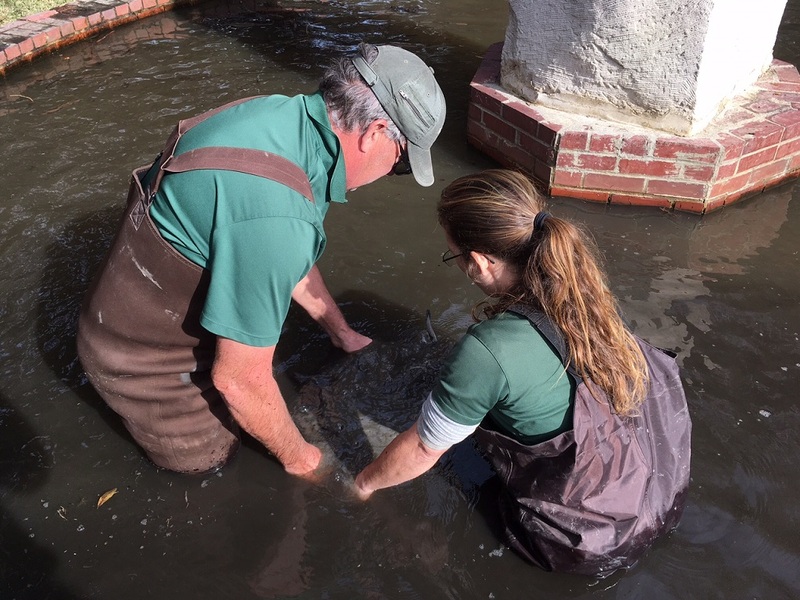 Gina, another Horticulturist assisting with this project, donned waders and hopped in. She started moving viable plant material to areas easily reached by the tractor. With Gina’s help, the cart was quickly filled. It was time to ferry the material to the Upper Left. 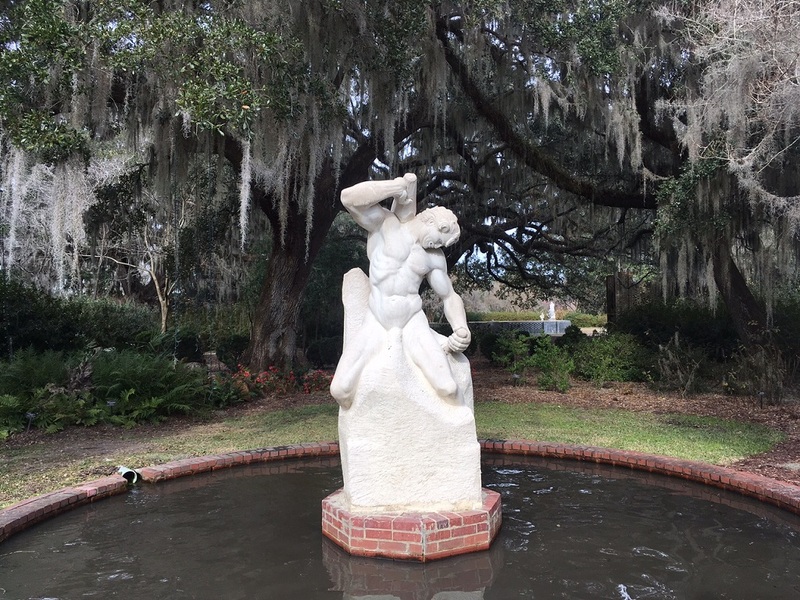 To protect Man Carving His Own Destiny from very dirty splashes, we covered the plant-rich soil with a tarp as it was emptied into the pool below. This became a humorous task. While a picture may be worth a thousand words, I found this video to be worth far more laughs. This process continued another two to three times with varying degrees of mess. 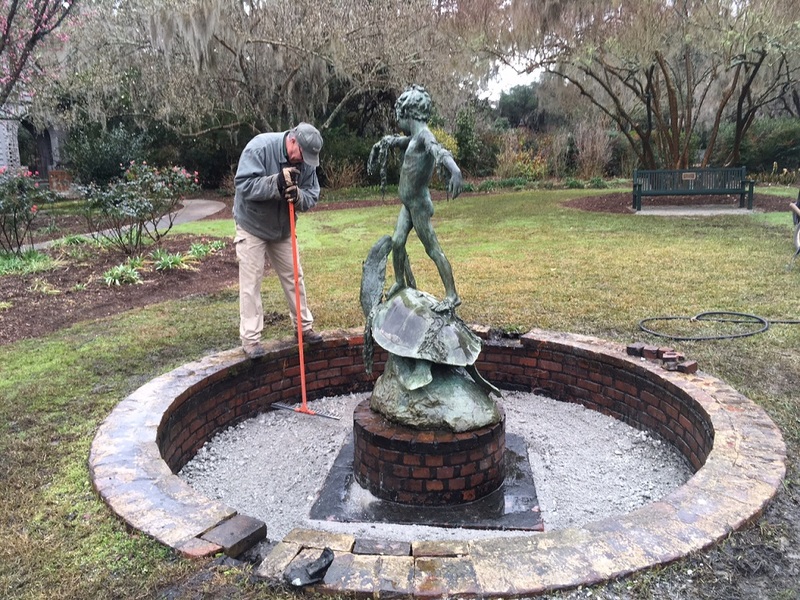 After all the viable material had been re-homed, the soil in Seaweed Fountain was to be removed and discarded. What remained was shoveled and loaded onto the tractor by hand. Fitting three of us into the interior of Seaweed Fountain was cramped, but we finished the job. 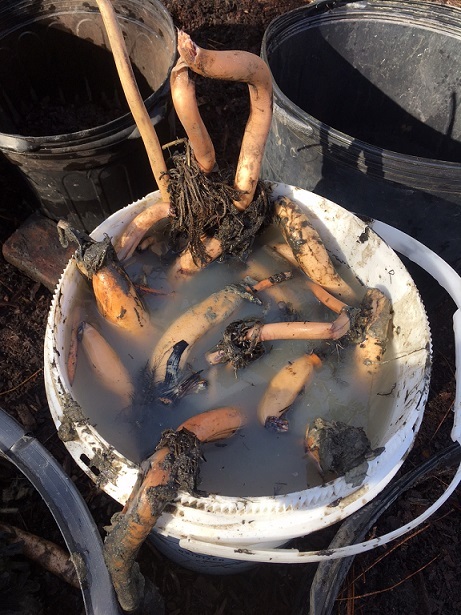 The “loose” tubers within the extracted soil had already been placed in the pool. Now it was time to put in our buckets of planted material. We loaded the buckets onto the Toro (and boy were they heavy!) and transported them to the Upper Left. Frank added more soil to top them off and keep the mulch from floating away in the pool. Gina and Frank drove and Brendan and I ran behind the cart, supporting the buckets that were close to the edge. Forget getting our steps in for the day, we got a sprint and a laugh in instead. We parked next to Man Carving His Own Destiny and got to work introducing the lotus to their new home. Brendan and I brought the buckets to the water’s edge. Gina and Frank, dressed in waders, jointly floated the containers to their resting sites. The buckets had to be held under the water until the air was out. This way, the buckets would not float away and would stay where they were intended. The way it worked out, the backside of Man Carving His Own Destiny was filled with loose soil and lotus, while the front half was filled with contained lotus in the buckets. We will keep an eye out to see how the lotus performs best: Loose and free or contained. Seaweed Fountain was empty! So what next? Just like your parents taught you, once you’re done making a mess, you clean it up. Frank gently hosed down the walls of the pool, removing any soil and debris that had gathered on them. On the third and final day, Frank and Gina returned. They emptied a couple of loads of gravel into the pool. Any remaining lotus would hopefully be hindered. This would also help establish a more evident bottom to the pool. 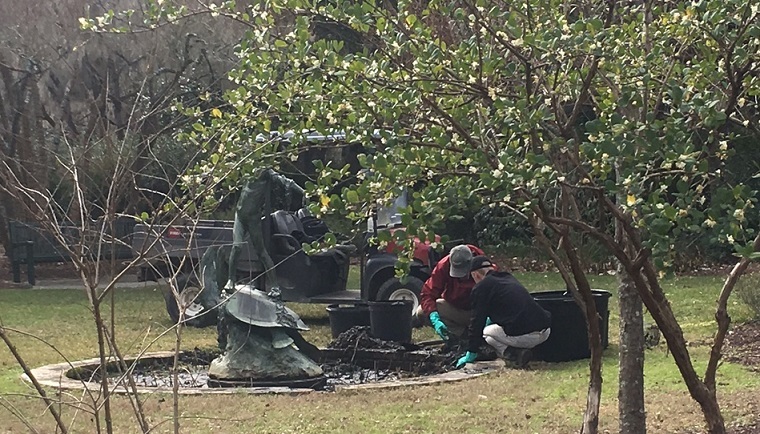 During our excavation, we concluded that there was no concrete or brick bottom, just clay and the base of the pool walls and pedestal holding the sculpture. Where do we go from here? 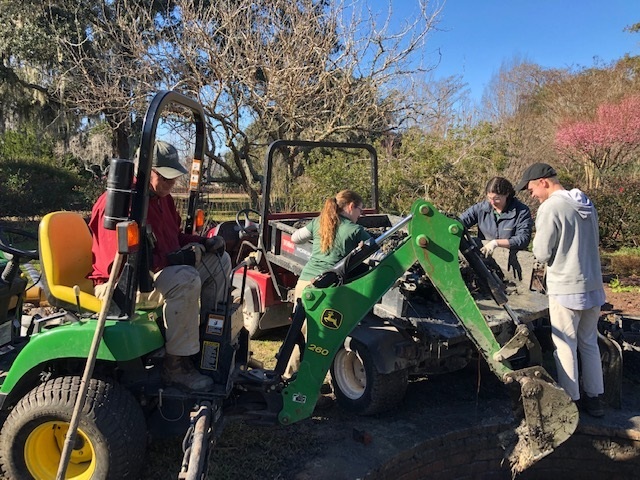 Although only in its infancy, a small group of volunteers led by Riley Reynolds and Jack Houston are forming a subgroup to help maintain and grow aquaculture at Brookgreen. 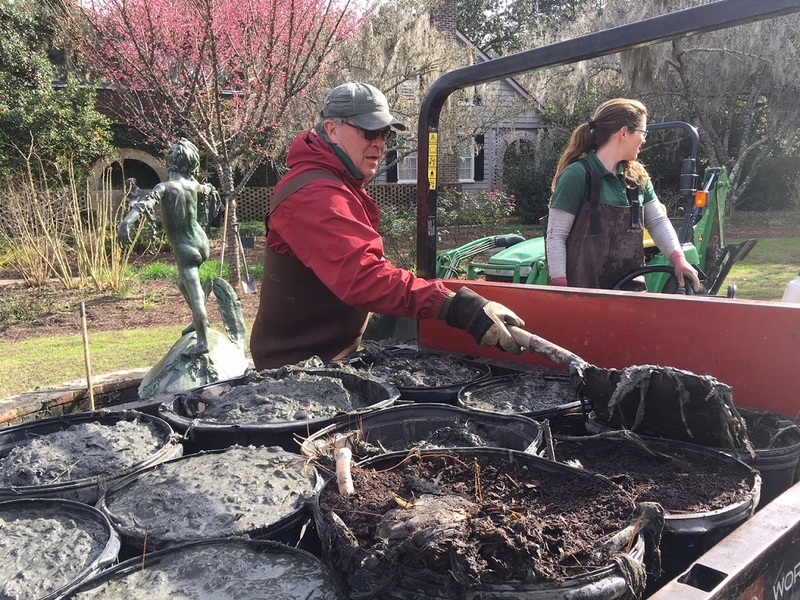 These volunteers are looking forward to including and maintaining more aquatic plantings. 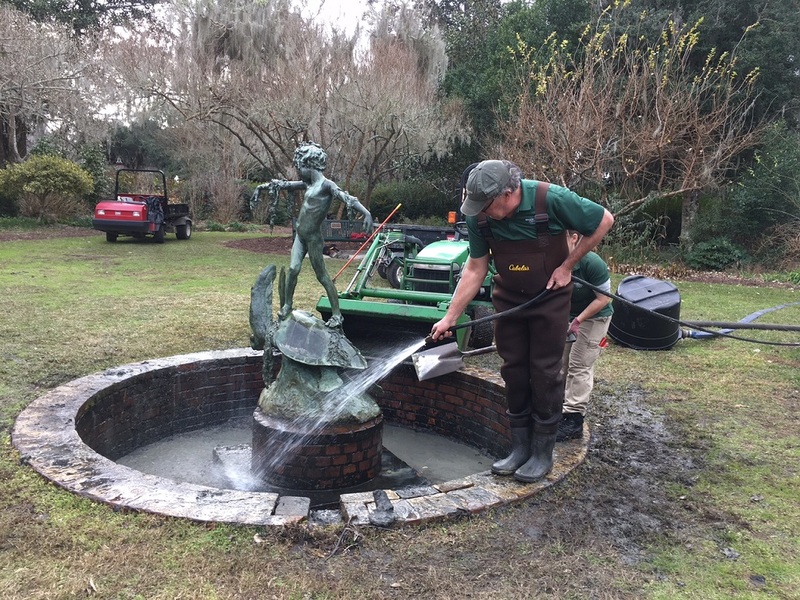 It is Frank’s goal to replant Seaweed Fountain with more lotus, but this time with a dwarf variety. We are excited to display the sculpture as it was intended, while also adorning it with the lotus we have come to cherish. Be sure to stop by this summer to see how everything is shaping up!